Arrow points of the Stoplight Switch, which is located near the brake pedal. When you press on the brake pedal, this switch is released and the brake lights turn on. If this switch fails, your car will be stuck in park! It’s an easy, cheap fix if you are flexible and small enough to get into tight spaces! Note that in this picture I have already disconnected the electrical connection. It’s that white thing hanging next to the switch. Yesterday I fixed a seemingly huge problem with a very easy solution. My 2005 Chevrolet Aveo was stuck in Park. No matter how hard I tried, I could not shift out of park. After doing a google search and quite a lot of reading, I found out that when the brake lights aren’t working, you can’t shift out of park. Sure enough, my brake lights weren’t lighting up. 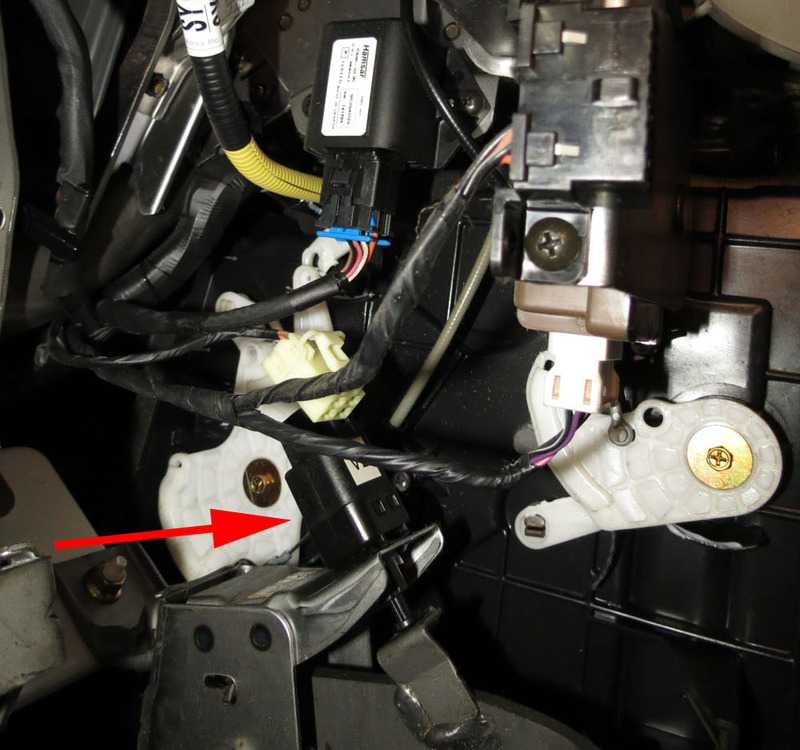 Most people online said the problem is in the switch that’s next to the brake pedal. They were right! The broken switch is called “The Stoplight Switch” (you’d think they’d call it a brake light switch, but they don’t). It costs about $10-12. Sure enough, I found the switch on Amazon they got it here in 2 business days. I ordered this one for my 2005 Aveo, but you should make sure you get the one for your model. Apparently this problem occurs in other years like the 2004 and 2006 Aveos as well. How do you replace the stoplight switch? The trickiest part of replacing the switch is its location. You can’t see it until you get your head on the floor of the car! If you put the driver’s seat all of the way back and you are a small enough person, you can get your head down on the floor and with a flashlight you can see it behind the pedals. To remove the old stoplight switch, you unplug it and then twist it counter-clockwise. Twisting it allows it to snap out of its position. You have to do this while holding down the brake pedeal. Putting in the new one is pretty easy, except that if you’re like me, it’s in a location that you can’t both see and work on at the same time. When I get to the angle where I can get my hands on it, I can’t see it. So I had to go by feel. That’s challenging, but I managed, and I’m still thrilled about by my success in my first ever car repair job. So there you go, a seemingly hard problem, solved. The cheapest car repair job in history!